I finally got around to ordering my indigo so that I could cover my burgundy hair color with something a little more modest. I’m sure the bright red henna’d hair I had before is appealing to some but it was not my cup of tea. I wasn’t quite ready for the lengthy two step process where you henna first, rinse out and then apply indigo for a jet black result. Instead, I mixed one package of Godrej Nupur Henna (50g) with 100 grams indigo. I ordered the indigo powder from Butters-n-Bars.com which is the same online store where I get my raw unrefined shea butter. 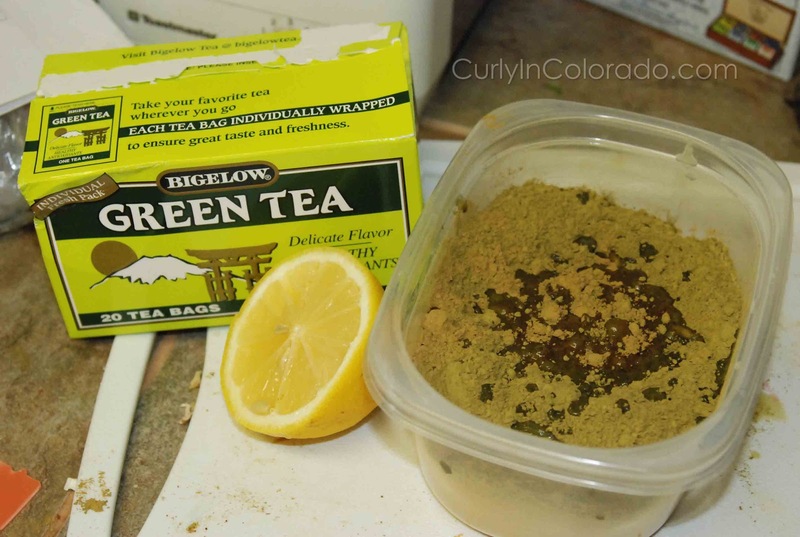 I kept the henna mix pretty simple as always and just mixed it with a mug of strong green tea to help the dye release. I added enough water to give the mixture a smooth, almost pancake batter consistency and let it sit overnight. 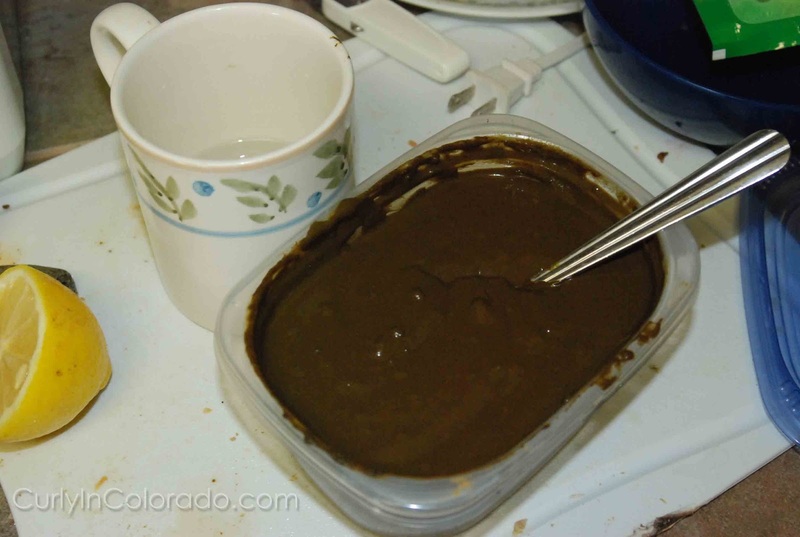 The next day, when I was ready to apply it, I mixed the indigo into a paste with just plain water and added it to the henna. I don’t add oils anymore because I read that it can slow the dyeing process. I applied the “Hendigo” to my hair like a clay mask and covered with plastic wrap. Then I waited for four hours before rinsing and then co-washing several times to get it all out of my hair. The application took very well to the majority of my hair but left my grey strands with just a tinge of color. I’m planning on doing another application to the roots and grey hairs sometime this week ’cause I don’t need everybody knowin’ how old I’m getting. If my greys are still too obvious afterward I may reconsider dyeing my hair all black with the two step process. As you can see from the title, I have finally decided that I’m going to attempt to cover my currently burgundy hair with a Semi-Permanent rinse. When I started using henna I mixed it with Indigo in order to get a brunette effect. I was never really successful but continued to use henna each month for the past year or so. Although, I love the benefits from using henna, I never really intended for my hair to end up so red. We’re talkin’ Rhianna type red in the sunlight at this point. I’ve been debating this for a few months now. Originally I decided that I would just order more indigo and do a two step henna/indigo process. This is where you apply the henna like normal and after rinsing it completely, apply the indigo for another 30 minutes to an hour and rinse. The result is Jet black hair and it is permanent. I know from past efforts that black hair does not look so hot against my skin tone. Somehow it makes my face look really red and I always have trouble adjusting my makeup palette to suit the black hair color. 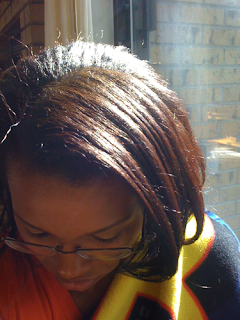 Because of this, the darkest I can go is a dark brown. For this reason, I decided to go with Clairol’s Beautiful Collection in the color Darkest Brown which has a neutral base. It is a formula that does not contain ammonia or peroxide. 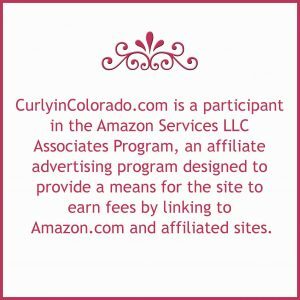 I’ve read over on NaturalSunshine.ning.com that the Clairol line is pretty much the only one considered gentle enough for Natural hair. I’m going this route because I figure the color result will be more predictable than trying to mix henna and indigo for the color I want. The only thing I’m concerned about at this point is the Isopropyl Alcohol which can be drying. I’m going to make sure and do a moisturizing deep conditioning treatment after rinsing the product and then do an ACV rinse to close down the hair cuticles. I’ll post pictures after the application and do a review. I’ve been using henna for the past year and a half now and can say that I have tried a few different types. I use it to blend my greys with the rest of my dark hair and keep my scalp issues at bay. Previously, I ordered it online but now purchase it locally from an Indian Grocery store. 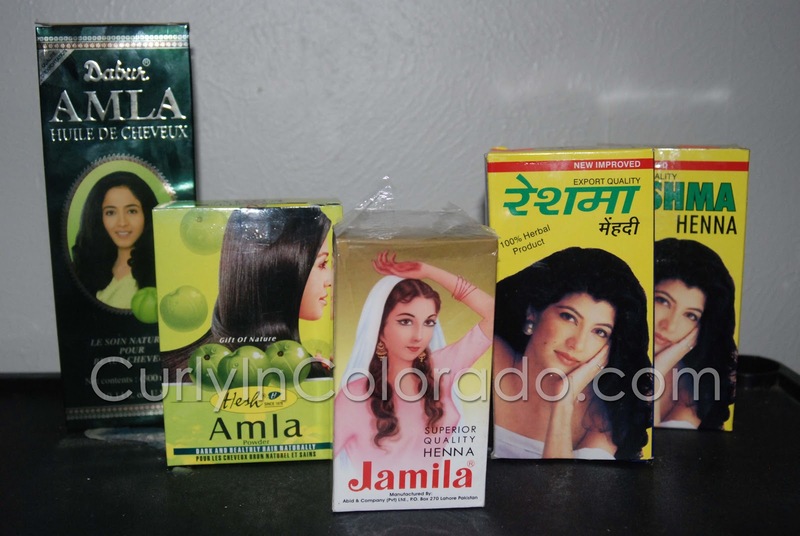 Recently I picked up a new brand from Ananda Bazaar in Aurora, that I heard others rave about in the hair forums. It’s called Godrej Nupur and is actually a mixture that includes brahmi (promotes hair growth), shikakai (cleanses hair and scalp), amla (darkens hair and prevents scalp infection) and bhringraj (conditions). Finding all of these in one package is quite a deal. 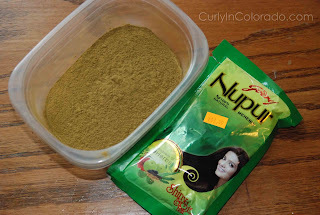 I figured at $1.49 (USD) per package, the Nupur henna was definitely worth a try. One package of Godrej Nupur henna holds 60 grams so I used two packages for my hair which is past shoulder length and very thick. I kept my mix pretty simple and just added green tea and juice from half a lemon. I added enough water to make it into a yogurt like consistency and let it sit for a few hours. 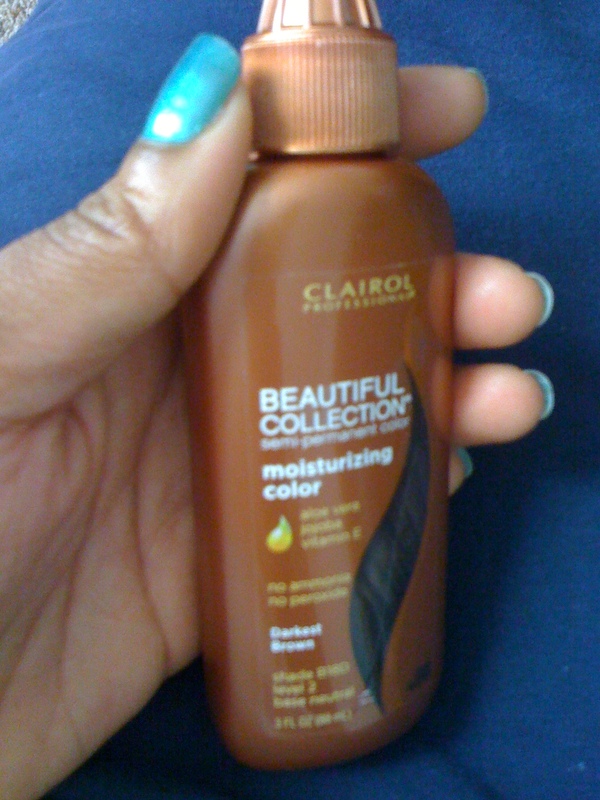 Before applying it to my hair, I added a little more water so that it was creamy enough to work with. One thing I noticed is that the texture of the henna is a lot smoother than some of the others I have worked with (i.e. Reshma and Jamila). This made it very easy to apply. The color took very well and did a good job of staining my greys that were starting to peek through. 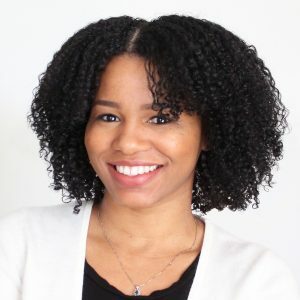 I have used the product twice since purchasing it and can definitely say that my hair appears to be darker which is more to my liking (I found out last year that my adding honey to my henna applications caused it to lighten my hair a little). 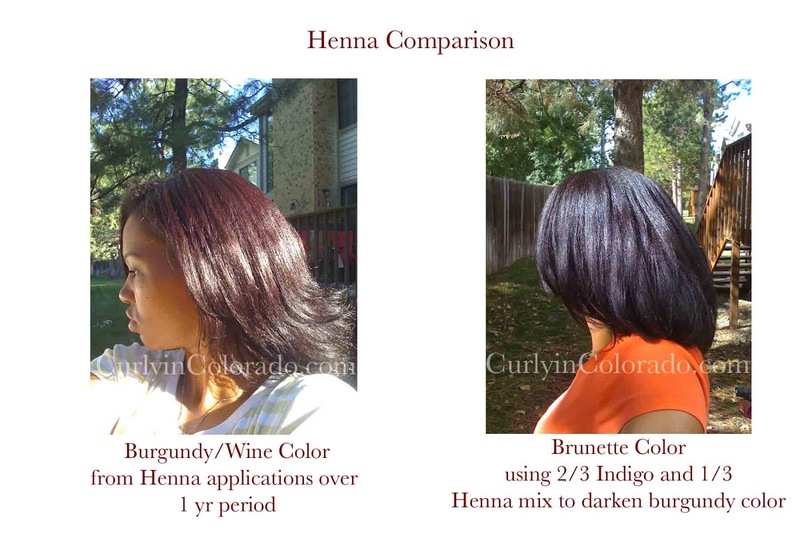 I was looking for a darker result so the Nupur henna works for me. 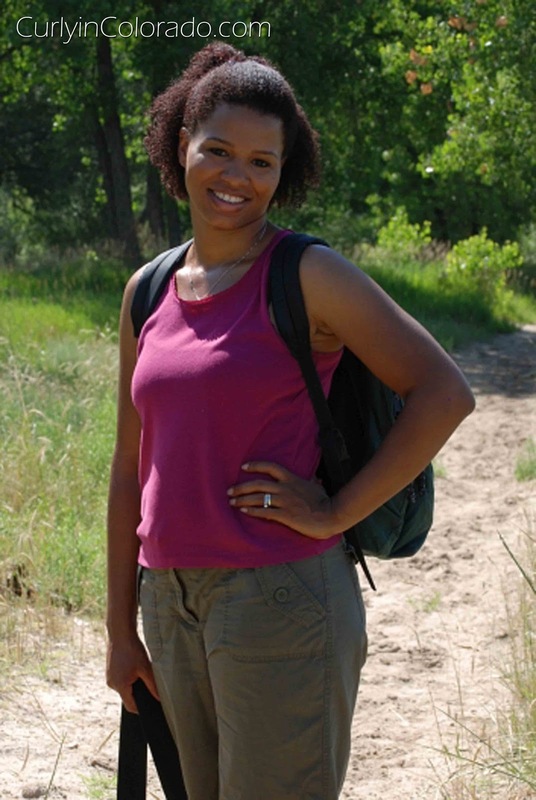 Even so, my hair still looks a deep burgundy color when I’m outside. For this reason I’m currently looking to do the 2 step process where you apply henna and then indigo to go completely black. Overall though, I enjoy using the Godrej Nupur and will make sure to keep it stocked in my ever growing henna stash. I started using Henna at the beginning of the year and immediately noticed its’ benefits. Unfortunately, I wasn’t too sure about the brand I used so I later found out that it possibly had sand in it as a filler. This is sometimes the case when buying from a local store because manufacturers have been known to add things to packaged Henna. determined to find it locally to save on shipping. I kept checking out different stores and finding mostly groceries and dvd’s. Today I decided to head back to the Ananda Bazaar in Aurora where I found the Henna I used on my first application. I was amazed to find that the shopkeeper is now selling the Henna brands I have been hearing everyone rave about. We’re talkin’ Reshma, Jamila and Hesh varieties. He also now carries Neem oil, Shikaki, Amla powder and Dabur’s Amla oil. For about $16, I left out of there with 5 boxes of product (less than half of what I would pay online). I wanted to by more but at least now I know where to go when I need my Henna fix..lol. After opening the henna boxes I was happy to see henna of a fine, powdery consistency without all of the additives I found in that first package. The Amla is to help darken the color so that the henna won’t be so red. I’ve also heard that it will keep the henna from loosening my curl pattern. It is already looser than before so I don’t want to lose my curls completely. Now I can’t wait to do my next application so I can cover up these stubborn grey hairs!